During winter it is not easy to train but so tempting to eat more than I should. After last weeks training I was feeling a bit tame on Monday and decided to skip training for the day, after all I am here to enjoy doing Ironmans and I've learned from the past that if I don't feel like training I give it a break and train when I enjoy it. That way I get more out of my training. I guess this time it was a mistake and the beginning of my mid winter "eat as much as you can" day, which became two days. I don't know why but I just let go and ate more than I was suppose to on Monday. Tuesday morning I felt better and did my morning tempo run but that's where it ended, training wise. 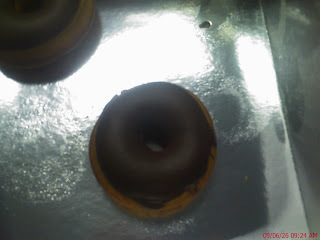 I continued with my eating spree and even had two doughnuts on Tuesday. There is a guy that comes to the dealership every morning with a trolley full of any food(unhealthy) that you can think of. I think he was so surprise to see me buying from him for two days as I NEVER buy from him. Come Wednesday you could see that he was disappointed that I didn't buy from him. As of this morning he didn't even bother to come to my office. If I have to list all the food I consumed on Monday and Tuesday this post will be a very long one. On Wednesday I was back on schedule with my eating and training or so I thought. Luckily I stuck to my eating plans but the training was not 100% on schedule. As I got to the gym after work to do my swimming the water was only 17c. With the outside temperature at 10c this is not fun. I really tried to push through the workout of 4.5km swim but the water was so cold and after 1km I was shivering while I was swimming. I just could not relax in the water and decided to get out. Since Thursday I am back on schedule and tried to catch up on some sessions lost during the week. I won't be able to catch up on all the lost sessions but I made up some. Tonight I must swim again and I've decided to go to the gym in the town where I work. The water is 26c, maybe a bit warm but I rather swim in 26c water than in 17c water and struggle to complete the session. Why is it that when you do something wrong or didn't achieve what you aimed for you always look for something to make you feel better or justify that, that you didn't do. On Thursday I looked at the 20 weeks prior to Ironman South Africa and compared that with Kona. I've made a chart comparing time and km's training between the two and that made me feel a bit better. For the first 4 weeks of the 20 week block I've done 605 km's more than IMSA and 39 hours more (Sounds a lot but the third week of IMSA had no training as I was sick). At least that made me feel better but now I just need to stick to my training program. When I did the comparison I saw some big training weeks during my IMSA schedule with virtually no down time. Thanks to Kimberley Schwartz (http://canadianironwoman.blogspot.com/) who directed me to the right place to get a countdown timer for Kona. I did have the one you download from the Ironman website with Powerbar articles but the date is wrong. They have it as the 11th of October and not the 10th. This irritated the crap out of me to see the wrong date every time I go to my blog. Ah, almost forgot. Got an email from Marco at the bike shop yesterday saying that my Cervelo P4 has been shipped to them and I will have it definitely next week. Wow, can this be true? Waited more than 9 months since I paid the deposit. Bike: 1h19, 44 km, 33.2 km/h, 1210 kcal, 140 bpm.